Heeney was one of the most selected forwards to start 2018, owned by 45% of coaches after improving his average by 18.9 from 2016 to 2017. He averaged 98.3 before his bye in round 14, with one score below 80 (being 75) as well as 6 scores over 100, including 2 over 115. In round 15 however, Heeney suffered a concussion on only 18 points and played less than half of the game, as well as missing the next week. Although we can’t control injuries as such, if you take out the 18, he averages 94. Most coaches would have also felt the effect of his concussion in the following weeks, as he had scores of 65, 66, 79 and 75 and didn’t appear 100%. As a whole, Heeney averaged 20.4 touches 4.5 marks and 5 tackles as well as kicking 19 goals in 2018. Heeney provides consistency and doesn’t rely on a single stat in order to score well. In every game he played, he got at least 2 marks and 1 tackle. He scored 100+ in 40.9% of matches, and only 5 games below 80 (4 taking out his 18), and 0 scores below 60 (again, taking out his 18). Playing in losses doesn’t affect his scoring either, averaging 90 in losses. Looking at his role, Heeney has played a mixture of midfield and a medium-forward type role. With the inclusion of Menzel and the emergence of other forwards such as Ronke and Papley, it forces Heeney into a more permanent midfield role. Having a look at the Swans potential best 22, Sinclair/Naismith rucking to Parker, Heeney and Kennedy with Clarke and Florent on the wings looks pretty likely, and would favour Heeney in terms of his fantasy output. In games where he got 25+ disposals, he averaged 106. Given he has the role I predict, that’s very encouraging signs being available as a FWD/MID. The first thing that comes to mind with Heeney is his ceiling, or lack of. In 2018, he did not score over 120 at all with his highest score being 118, and only went over 110 twice. He has 3 scores above 120 in his career and a highest of 127. He rarely gets more than 3 goals in a game and didn’t get 30+ disposals in any game in 2018, with his career highest being 32. Hopefully a move to the midfield can see his 2018 average of 20 disposals lift up to the 25+ mark, and erase the worries of a poor ceiling. Whilst Heeney’s overall scores may look pretty consistent, his in-game scoring certainly wasn’t and left some coaches stunned either mid or post-match. At half time, he could be on 20 or 80, and would still finish the game near 100. It was like he switched off when he got a decent score. In round 1, he was on 90 points at 3 quarter time, looking at a nice 120+ score to start the year…but didn’t even reach 100. Then a week later, he was on 4 at quarter time and 29 at the half, but finished on 88. This may not concern you if you don’t check the scores every 20 seconds, but for most coaches this is a bit of a turn-off. Another issue with Heeney is that he may not be a 100+ averaging type player. He will no doubt have an impact on the game, but isn’t much of an accumulator like Devon Smith with his tackles, or Patrick Dangerfield with his disposals. But as I’ve said a few times, hopefully a more permanent midfield position will be available and allow him to get more disposals and tackles (etc). QUEEN – The options in the forward line aren’t as rich as those in the midfield or defence, and Heeney is a really viable selection, preferably at F2/3. He is consistent, durable and possibly 10 points underpriced due to the 18 he scored when he got concussed, and the follow on affects from that. If we see a more permanent midfield role in the JLT, he is certainly one to consider. I can see why you would got someone like Smith, Dunkley or Wingard over him, but if he improves his ceiling early in the year, no doubt he will be an upgrade target later in the year. 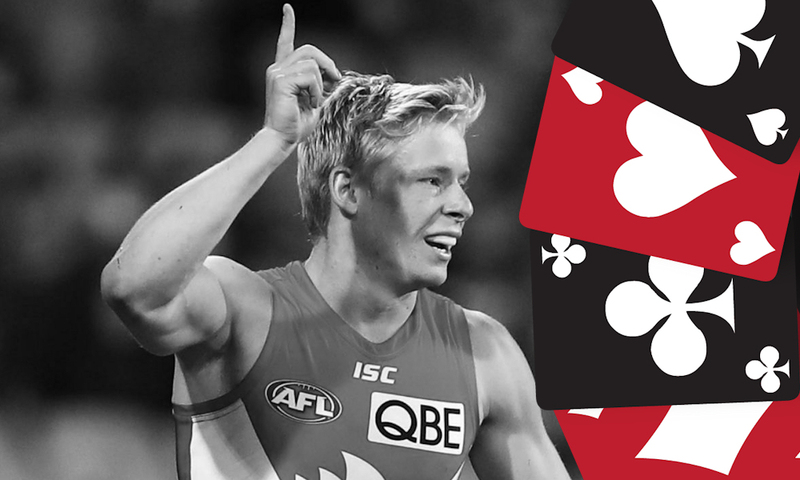 What does Isaac Heeney average this year? Great article Ben although your comment that he is 10 points underpriced due to his 18 score is not correct. Had he scored 90 in that match his average would have gone up 4, not 10. Even so, I will be starting with him as I do believe he will get extra midfield minutes.